Via University of Pennsylvania website. 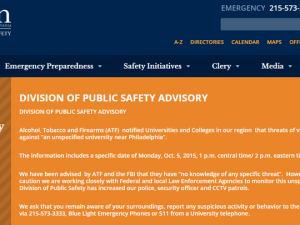 The FBI warned of an “unspecified” threat of violence at universities in Philadelphia. The FBI and ATF are monitoring the threats and issued the warnings. Alerts were sent to students and faculty at the University of Philadelphia, Temple University and Drexel University. The schools plan to operate normally but students were warned on university websites to be vigilant. “Although the FBI has assured us there is no specific threat to a particular college or university, we are taking this very seriously and are taking extra precautions to protect the Drexel community,” a statement read on Drexel University’s website. Posted: 10/5/15 at 10:03 AM under News Story.